Last month I joined my friend John and his lovely lady friend for Sunday lunch at Pipero al Rex. The restaurant opened on the ground floor of the Rex Hotel near Stazione Termini in early October and is the urban reincarnation of Alessandro Pipero’s eponymous restaurant, which he closed in nearby Albano Laziale last year. 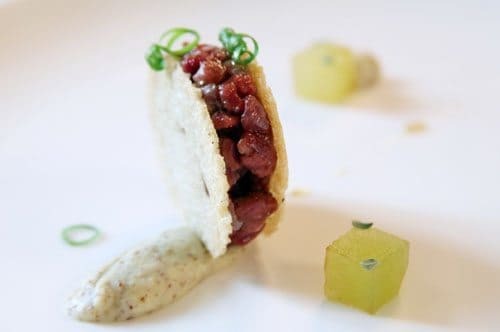 Duck breast tartare with green apple and mustard. This tied for my favorite dish along with the carbonara and chicken. This starter had really nicely contrasting flavors and a pleasant richness. 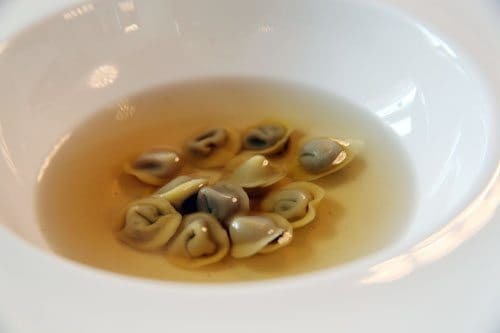 Giandiua-filled cappelletti in squab broth. Around a third of the cappelletti were filled with liver, which offset the subtle sweetness of the chocolate-hazelnut paste and matched its creaminess. Now that I think of it, this was right up there with the duck tartare, carbonara, and chicken. Super dish. 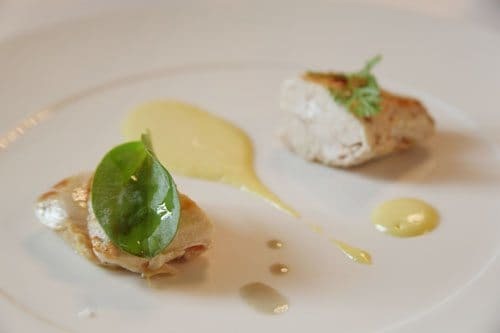 Sous vide chicken with oyster mayonaise. This was a really light and tender chicken dish and the subtle oyster mayo brought a pleasant viscosity. 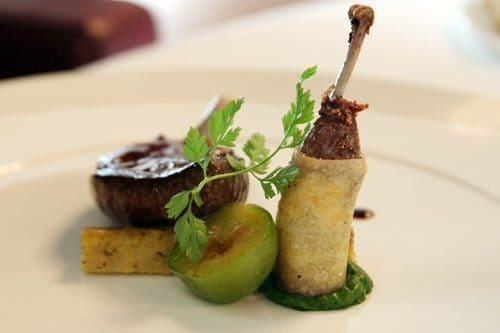 Squab with figs and polenta. The meat was nicely cooked and rare. The fig’s sweetness was a fine pairing with the juicy squab. This dish was followed by a plate of carbonara (the house specialty, which is sold in 50g increments and has its own dedicated page on the menu). We were a bit disappointed that it hadn’t come with the menu and joked it would make a fitting dessert. Pipero agreed and brought it to the table as a sort of pre-dessert. 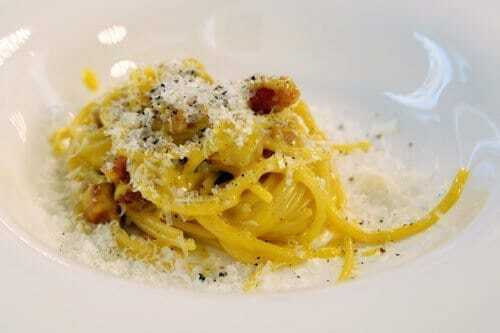 This break with the coursing canon to indulge in carbonara was a brilliant, if heavy, success. I was a bit less enthusiastic about the first dessert, called simply “pineapple and pineapple”. Who do I talk to about banishing pineapple from Roman desserts. The next dessert was interesting and presented a surprising combination of autumnal produce: bits of persimmon were dusted with cinnamon and hazelnuts and topped with a scoop of porcini mushroom ice cream and a spongy cake. I think I liked it. But I’m still not sure. 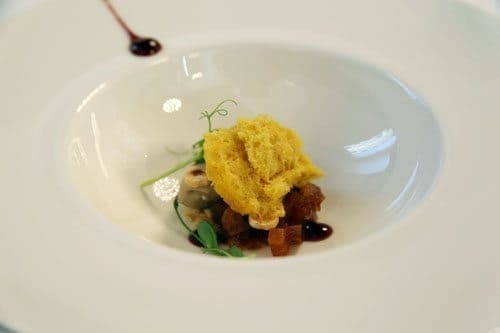 The meal came to just over €100 per peson, including the tasting menu, a small portion of carbonara and a sip or two of wine. We thoroughly enjoyed the tasting menu and agreed it was one of the better meals we had had in Rome lately. I’m anxious to return, perhaps for a beautifully al dente carbonara at lunchtime or a few a la carte dishes at dinner. But then again, I wouldn’t rule out a second stab at that tasting menu. Mon-Sat 12:30-15 & 19:30-23, Sun 13-15. Sign me up for the anti-ananas squad. We loved Pipero in Albano, but there was Caceres. Haven’t tried this yet but it’s on our list. Didn’t like Metamorfosi as much as we had Pipero — the secondi were a big disappointment. 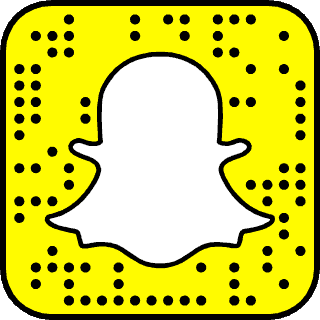 I live in the US and I am a Pipero exploring my heritage. How did this resteraunt come up with its name? Thank you. The owner’s name is Alessandro Pipero. Do you know where your family is from? Thanks for all the interesting information you post about Rome. I will be in Eternal City in October and am interesting in eating at Pipero al Rex especially since I will be in the neighborhood. How far in advance do you recommend making reservations? hi rap! book a week in advance!